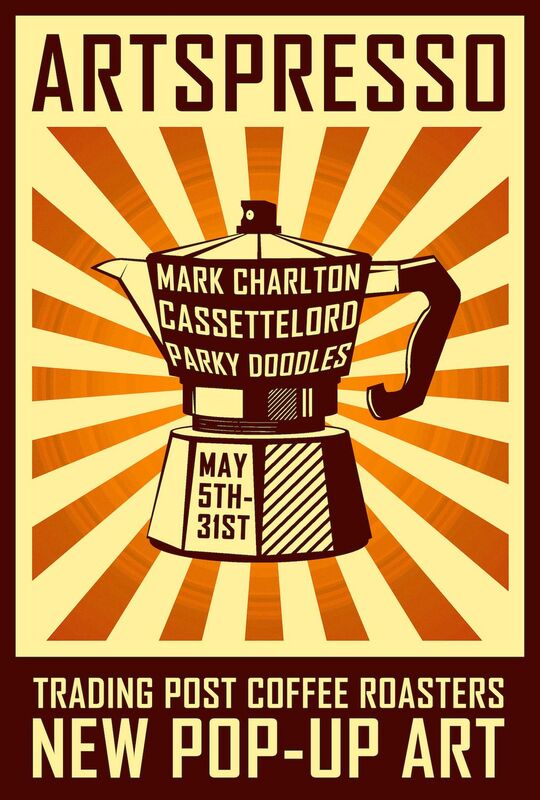 We are delighted to invite you to a private view of work by Mark Charlton, Cassette Lord and Parky Doodles on 6th May 2017 at 36 Ship St, Brighton BN1 1AB. After a successful opening group show ‘Christmas goes POP!’ at Vine Street Studios, Space Invader Crew are proud to launch ‘ARTSPRESSO’ at Trading Post Coffee Roasters a joint art exhibition with Mark Charlton, Cassette Lord and Parky Doodles. This exhibition will show new and original works from the artists. In addition, exclusive limited edition collages, paintings and posters will be available only at the Trading Post Coffee Roasters. Opening on Friday 5th May at 8pm with refreshments courtesy of our sponsors Trading Post Coffee Roasters. Space Invader Crew aims to make their art available to everyone.